In 1992 developing countries in Asia and the Pacific accounted for just less than 54 percent of the world population - nearly 3000 million people. Yet these countries had only 17 percent of the world's land resources. Even so, countries in Asia and the Pacific are relatively well fed compared, for example, to much of Africa and parts of Central and South America. This is because they have made profitable use of new agricultural technology, such as fertilizers, high-yielding crop varieties, mechanization and irrigation. During the period ]961-85, 93 percent of the region's increase in cereal production was due to increased production inputs. As a result food production has more than kept pace with population increase. While agricultural productivity has risen dramatically, the cost in land degradation has been high. Large areas of the region's cropland, grassland, woodland and forest are now seriously degraded. Water and wind erosion are the major problems but salinity, sodicity and alkalinity are also widespread; water tables have been over-exploited; soil fertility has been reduced; and where mangrove forest has been cleared for aquaculture or urban expansion, coastal erosion has been a common result. Finally, urban expansion has become a major form of land degradation, removing large areas of the best agricultural land from production. The effect of these forms of land degradation on cereal production has so far been masked by the increasing levels of agricultural inputs that are used. However, production of other crops, such as pulses, roots and tubers, has now begun to decline. It is no coincidence that these crops arc grown on land with low production potential, where rates of land degradation are highest. In the Philippines, for example, it is estimated that soil erosion carries away a volume of soil equivalent to one metre deep over 200 000 hectares every year. In India, some 144 million hectares of land are affected by either wind or water erosion. In Pakistan, 8.1 million hectares of land have been lost to wind erosion and 7.4 million hectares to water erosion. Deforestation is also widespread. During the 1980s, an estimated four million hectares of forest were lost each year in Asia and the Pacific. The destruction of the forests is mainly a result of clearance for agriculture. The search for fuelwood, as well as the growing frequency and severity of forest and bush fires, are also taking their toll. In Nepal, excessive fuelwood harvesting and cutting for fodder have severely degraded forests - some 40 percent of buffalo feed and 25 percent of the feed for cows is traditionally provided by the leaves of trees. In India, which supports 15 percent of the world's cattle and 46 percent of the world's buffalo, upland forests have been severely overgrazed. Deforestation has led to a severe shortage of fuelwood and building materials in many areas. Crop residues and animal manure, which were previously returned to the soil to add valuable nutrients, are having to he burnt for fuel. The region's grasslands are also being destroyed - a matter of great economic importance since grazing is the largest land use in Asia. Grasslands are under attack from over-intensive grazing and from the incursion of marginal agriculture which often fails and then leaves a residue of degraded land. In a converse of logic, as grazing areas decrease, livestock numbers often increase. Grazing areas are often located at the source of important catchment areas, influencing downstream agricultural and settlement so the cost of their deterioration is high. The problem of the 'vanishing grasslands' is particularly serious in countries where grazing lands are used communally, but livestock are private property. It is virtually impossible to stop overgrazing in areas where grazing rights are not defined. No nation in the region has an effective plan of action to meet this challenge. Land degradation is also altering hydrological conditions Where vegetative cover is removed, the soil surface is exposed to the impact of raindrops which causes a sealing of the soil surface. Less rain then infiltrates the soil. Runoff increases, stream flows fluctuate more than before, flooding becomes more frequent and extensive, and streams and springs become ephemeral. These conditions encourage erosion; as a result, sediment loads in rivers are increasing, dams are filling with silt, hydro-electric schemes are being damaged, navigable waterways are being blocked and water quality is deteriorating. In several parts of India, the potential life of reservoirs has been more than halved by sedimentation rates that are ten times higher shall those assumed by the designers. China's Loess Plateau - the 600 000 km2 watershed of the Yellow River in Shaanxi, Shanxi, Gansu, Inner Mongolia, Ningxia-Hui, Qinghai and west Henan - is one of the most severely eroded in the world. Intensive cultivation on steeply sloping hillsides, using outdated techniques, has meant that an estimated 1600 million tonnes of fine yellow silt (after which colour the river is named) are washed away every year. In Mizhi County, more than 60 percent of the area has slopes of more than 20 percent and annual soil losses have reached more than 20 000 tonnes/km2. The plateau supports a population of 155 million people who are among the poorest in China, many living in caves dug into gully or terrace walls. In the Nihegou catchment area in Chunhua County, for example, in 1985 average annual per caput food production was 430 kg and net income was 210 yuan (about US$30). 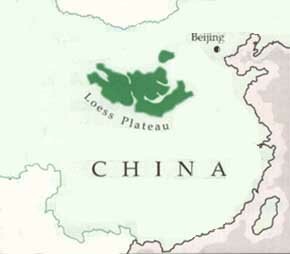 Yet the Loess Plateau is intrinsically fertile, is easy to till and has enormous agricultural potential. New crops such as tobacco, groundnuts and water melons are being introduced with success, and the planting of apple trees has increased farm income in many areas. The most authoritative estimates of the extent of land degradation are contained in a report on South Asia prepared by UNDP, UNEP and FAO (Land Degradation in South Asia: its severity, causes and effects upon the people, Rome, FAO, 1994). Water erosion is the most common form of degradation in the area, affecting 25 percent of agricultural land. Wind erosion affects 40 percent of the agricultural land in the dry zone. There is also a widespread decline in soil fertility and extensive waterlogging and salinization in irrigated areas. This report analyses the effects of various forms of land degradation on the economies of countries in South Asia. It concludes that land degradation is costing countries of the region at least US$10 billion a year, simply in terms of lost agricultural production. This is equivalent to 7 percent of South Asia's agricultural gross domestic product. Asian farmers and pastoralists have not always caused such problems. Traditional systems of land use were compatible with the environment - for example shifting cultivation in the humid tropics and nomadic grazing in the semi-arid areas. Nomadic pastoralists traditionally moved with herds of animals to different areas of good grazing and water supply as seasons and conditions changed. With low stocking levels they were able to move to new areas before the reserves of any single area were irreversibly depleted and the soil laid bare. Problems arose when populations started to increase, and the pressure on land resources became more severe. There is no longer enough land to allow long fallow periods; more and larger herds compete for forage; and other traditional systems of land use are being placed under increasing strain. Farmers have responded by trying to develop new land. As a result, marginal land - steep land, land in areas of uncertain rainfall and land with poor, erodible soils - is being overused. Large areas of forest have been destroyed and much traditional pasture put under the plough. Shifting cultivation, in its currently common forms, is a major problem in the region where it is practiced by at least 22 million people over an area of some 63 million hectares. There are six major causes of land degradation in the region: deforestation, shortage of land due to increased populations, poor land use, insecure land tenure, inappropriate land management practices and poverty. This situation is particularly serious in Asia and the Pacific because most good agricultural land has already been opened up. Indeed, the region as a whole may already have passed the safe limits for agricultural expansion. The region had only about 0.14 hectares of arable and permanently cropped land per head of population in 1990, compared to about 0.4 hectares in the rest of the world. Outside Asia and the Pacific, agricultural expansion has more or less kept pace with population growth since the early 1960s. The fact that it has not kept pace with population growth in Asia and the Pacific is the region's principal cause of land degradation.  more people move to urban areas, adding to congestion, pollution and often removing yet more prime agricultural land from production. The two most important driving forces of land degradation in Asia and the Pacific are limited land resources and population increase. The result is small farms, low production per person and increasing landlessness. A consequence of land shortage is poverty. 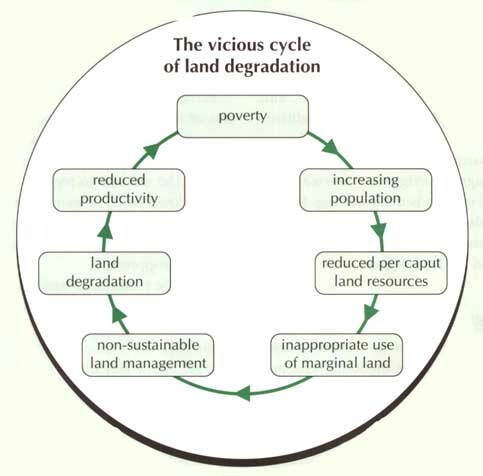 Land shortage and poverty, taken together, lead to non-sustainable land management practices, the direct causes of degradation. Poor farmers are led to clear forest, cultivate steep slopes without conservation, overgraze rangelands and make unbalanced fertilizer applications. Land degradation then leads to reduced productivity: a lower response to the same inputs or, where farmers possess the resources, a need for higher inputs to maintain crop yields and farm incomes. This has the effect of increasing land shortage still further, thus completing the cycle. Substantial efforts have been made by individual farmers, national governments and international agencies to counteract the cycle of poverty and land degradation by research and development of improved technology. Much success has been achieved, as in the spread of high-yielding crop varieties and use of fertilizers in the 'green revolution'. This effort may be nullified if it is not accompanied by a reduction in population growth rates. Governments of the region, as well as international agencies, recognize the need to limit increases in population. There is also a growing awareness that population questions cannot be treated in isolation, but must be linked with sustainable land development. As FAO has put it, 'A lack of control over resources; population growth; a lack of alternative avenues of livelihood: and inequity are all contributing to the degradation of the region's resources. In turn, environmental degradation perpetuates poverty, as the poorest attempt to survive on a diminishing resource base'.